Stainless steel slim knuckle ball bearing fire door hinges tested to BS EN 1935 and Certifire Approved, Grade 13 for doors up to 120kg. Size 4inch (102mm x 76mm x 2.5mm with 10mm slim knuckle). 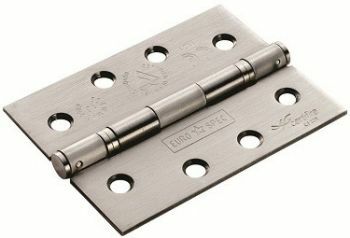 Available in Satin Stainless Steel or Polished Stainless Steel - hinges priced in pairs, supplied with screws.